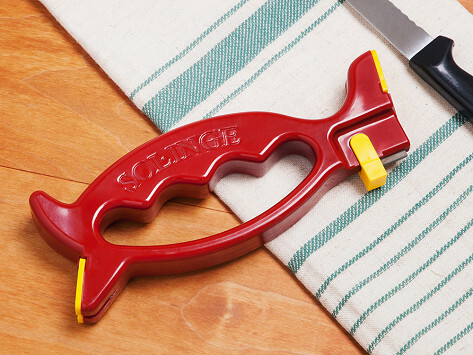 Sol.inge is an all-in-one blade sharpener with self-adjusting plates—a feature that creates the right angle for whatever blade you need to sharpen. 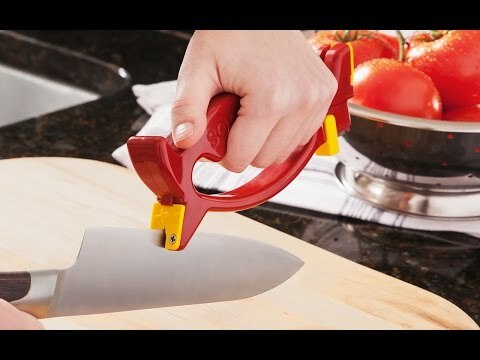 Two self-adjusting surfaces let you work on a variety of tools, from kitchen knives (even notoriously tricky serrated ones) to scissors, tweezers and many more. A stationery blade works for hefty tools like garden shears. A smaller pop-out blade even hones the blades on cheese graters, potato peelers, nail clippers, and other tinier tools. Dimensions: 7" x 2.75" x 0.75"
Stocking up on stocking stuffers. My Best Gadget from 2018! My skepticism was blown away after using Sol.inge sharpener. I admit when using it for the first time it felt weird to have the knife's blade facing up, but the tool protects your fingers. Sharpened one knife and was amazed how incredibly sharp the knife was. I use this only on my knives, but it seems to do the best job of any sharpener I've tried. Creator Marc Adam has been perfecting this sharpener for years, combining his efforts with knife makers and engineers. He made this tool so versatile that it will put an end to dull, annoyingly ineffective blades.